Home » gog.com , video games , wing commander , wing commander iii » WING COMMANDER III: HEART OF THE TIGER now being sold on GOG.com! WING COMMANDER III: HEART OF THE TIGER now being sold on GOG.com! This is a game that I've been waiting since the autumn of 1994 to play! Seriously. I didn't have a rig powerful enough at the time to justify getting it. 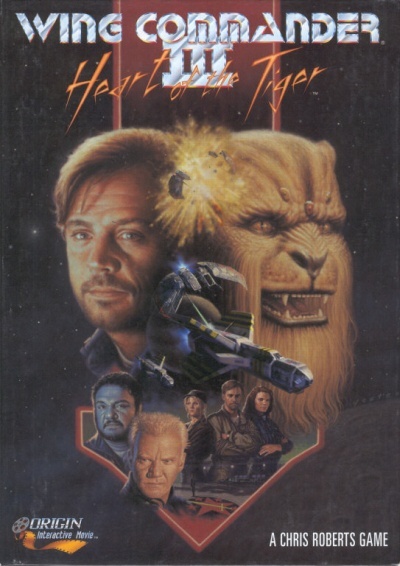 And during the past decade and a half the only way to get it was to pay ridiculously high prices on eBay for the Wing Commander: The Kilrathi Saga box set that put the first three games into one package for post-DOS PCs. Online classic games vendor GOG.com has made Wing Commander III: Heart of the Tiger available for purchase! For $5.99 you get the game as a 1.6 gigabyte download. And if you've never played a Wing Commander game before you can also get Wing Commander I and Wing Commander II: Vengeance of the Kilrathi as one package, also for $5.99. And GOG.com also has "sidequel" Wing Commander: Privateer available as well. But it's Wing Commander III that has me slobbering like mad tonight. This game was practically an entire full-length motion picture that gave players the chance to determine how the plot played out. The cutscenes used greenscreens and CGI art to create completely virtual sets to tell its galaxy-spanning epic. And then there was the acting talent that was brought aboard for the project: Tom Wilson (aka Biff from the Back To The Future trilogy), John-Rhys Davies (Gimli from The Lord of the Rings trilogy among many other roles), Malcolm McDowell (Alex from A Clockwork Orange) and as main character Christopher Blair, Mark Hamill (who was in a series of art-house movies back in the day, "Star Wars" something or other...).